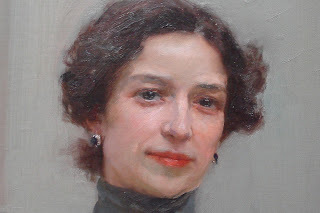 Okay, if you are an artist or painter and have met me in person, or if you are a friend, or know of me by reputation – then you probably know I am a certified Sorolla Nut. 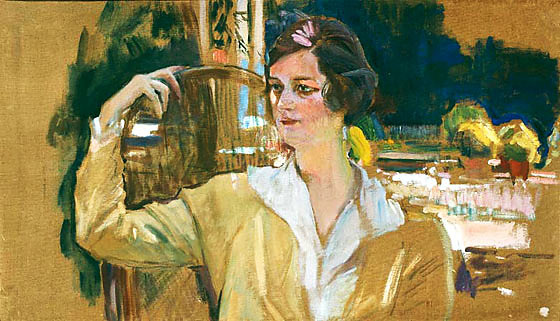 Meaning, a slobbering fan of the Valencian Spanish painter, Joaquin Sorolla y Bastida, who's life and career spanned the late 19th and early 20th century. There isn't much print out there in English on Sorolla, and what there is can be rather expensive to get your hands on. And there aren't many paintings by him to find in North America. 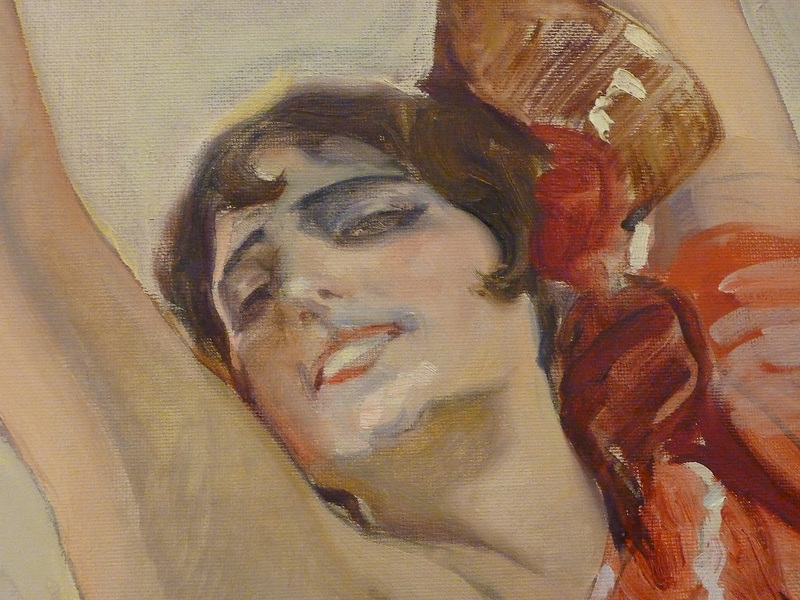 You may find the a Sorolla or two included in a traveling Spanish exhibition, and there are his large murals installed in the Hispanic Society in New York City, but that's about all you'll see without flying off to Spain. So Sorolla is another great European painter largely unknown to most Americans, waiting to inspire anyone willing to suss his work out. 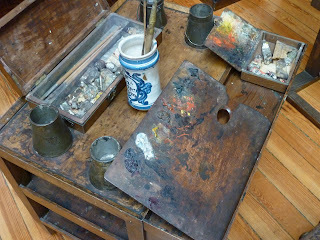 Apparently, about two years ago, Donald Pettenger toured Sorolla's studio and shot photos of how things were laid out. Images which include a rare unfinished work, an indoor palette, some brushes and tools, and a taboret. A veritable time capsule for a painting-geek like me. So I thought we could take a brief and somewhat imaginary tour of Sorolla's workspace using the following images gleaned from Donald's site, and have a little fun speculating as we go. since so much of his voodoo started there. 1. I can't identify all the colors on Sorolla's palette but it looks like a fairly standard set of earth colors for his time. But what immediately interested me is how this palette was biased towards the warm. Sorolla's career spanned late Impressionism, Post-impressionism, and the advent of Post-WWI Modernism . I know we are looking at his indoor palette and that his outdoor palette also included cooler colors. We know from examining his outdoor work he painted with cobalt or ultramarine blue, and certainly made use of a lot of cobalt or manganese violet as well. But the limited earth color palette you see here seems consistent with both his indoor and outdoor work. The agreed upon Sorolla outdoor palette: cobalt violet, rose madder, all the cadmium reds, cadmium orange, all the cadmium yellows, yellow ochre, chrome green, viridian, Prussian blue, cobalt blue, French ultramarine and lead white. 2. But what is of more interest to me is how Sorolla placed his black next to his white. (see the yellow arrow) This suggests he may have been mixing a number of gray values first and then pushing purer hues into them. (mental note to self, give this a try...) The large area of silvery gray in the left area of the palette supports this theory. 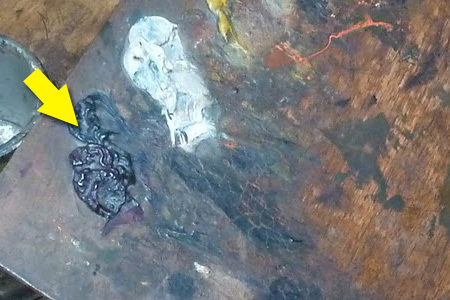 This in contrast to the complementary mixing method often taught to painters today. Having said that, I wouldn't assume for a second that Sorolla always mixed a gray and added a hue because his paintings don't support that simple an explanation. But the light and dark masses which made up his powerful compositions were always calculated to leave a value gap between each other and that is one of the things I believe contributed to his astounding ability to conjure up the illusion of bright sunlight. So I find it intriguing that Sorolla placed his black next to his white when all his other hues moved clock-wise from light to dark around the palette. Most artists would put that black the far end to maintain the logic. 4. It appears that Sorolla also had a preference for filberts, and rather long ones by today's standards. Not as long as eggberts, since those brushes tend to become floppy or splay, and thus make thicker paint harder to push around. But it appears that Sorolla was painting with something akin to the filberts we have available today. Again, perhaps not exclusively, since we only find a few of his brushes in these photos. But when you look at the surfaces of his work, the bumps and valleys created by the lift and pull of his touches don't suggest the use of feathery or soft haired brushes, or short stiff brights, or flats either. Instead, his surfaces suggest the use of a filbert. And one filbert can create a wide range of touches without becoming monotonous in the repetition. This may be a reason why we see so few brushes here. 5. It is extremely rare to come across an unfinished Sorolla. But when we do find one it becomes clear he was a Classicist in his approach to how he constructed his work. Sorolla clearly preferred to paint from thin-to-thick and build up his painting carefully, saving the juicy bravura top work for the finish. 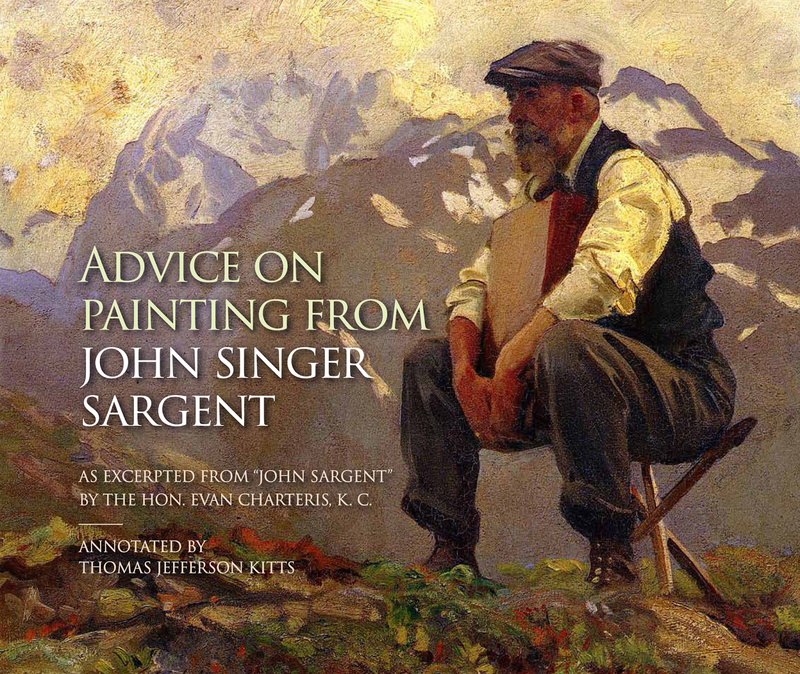 Much like Sargent and Zorn. Or, for that matter, any other oil painter who owes a debt to Velasquez and Franz Hal. Sorolla was a painter who became interested in aligning the directional gestures of his pulls with the surface planes of his subject; whether he was painting a sail, a cloud, or the shine of wet human flesh. 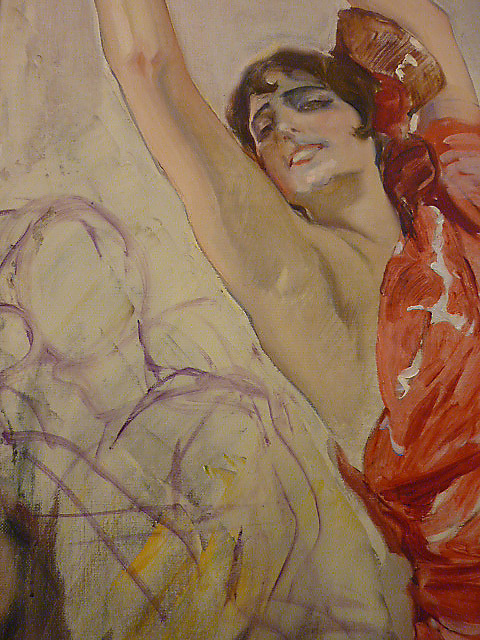 In this way Sorolla instilled a sense of life into the paint itself. Can I say with authority this is how Sorolla painted? Well, not really. I've not had enough original Sorollas to look at, or enough time to be with the few I've been lucky to come across. Plus it is important to remember very few painters painted the same way their entire life. Painters tend to evolve over time, often going back and forth between a number of established methods, maturing as they go. But speculations like the ones I have shared can spark our imagination and set us on a new path. 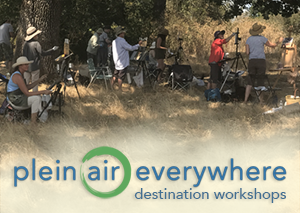 They can suggest something new to try, or change the way we paint, or perhaps simply cause us to think about a painting in a new way At least they can for a geek like me. Whoops, I meant a Sorolla Nut instead. 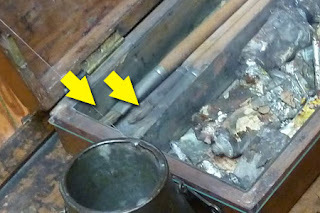 The multiple resevoirs may have included 2 turp cans for double dipping; first one removes most of the paint, the second gets the remaining residue...a number of painters do this. Excellent point Eric, and thanks for sharing it. Sometimes the simpler explanation makes the most sense. And for those who don't know Eric Bowman or his work, he's a great figure painter. Check out his latest posting on color temperature and skin. Nice work. Nice speed painting too! Great post. The photos of Sorolla's palette are a treat. Might at least one of those pots have contained oil, or a painting medium of some sort? I suppose so, Frank. But it doesn't seem likely to me the Sorolla would have had that much oil or medium out at once. But I couldn't say either way. However, since you raised the possibility of the cans containing oil, if Sorolla placed his brushes in a non-drying oil, or even walnut oil to prevent them from drying out between working sessions, then a reservoir that size would make sense. 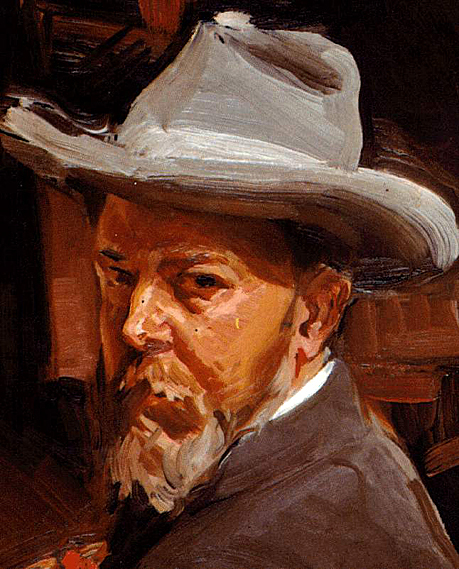 Did Sorolla use a lot of linseed oil? Why were his NYC works sent to Spain for cleaning before his exhibit in US? As for why his painting were sent to Spain for cleaning, I cannot say either, beyond speculating some politics may have been involved. Or, perhaps there is more knowledge there about how he constructed his paintings. Conservation and restoration of a work of art can sometimes become rather political. The cleaning of the Sistine Chapel comes to mind as an example. While the science of conservation has become increasingly more precise, an oil painting changes in ways over time which prevent it from truly being returned to the state an artist left it at. I was reading a long post by G.T. Thurmond about Henry Hensche's colorist theory and Sorolla was mentioned there also.